When I look back at my old posts, I sometimes think ‘really did I take those pictures?’ Not that I’m any better now as there’s still so much to learn about photography and styling. However, I do want to give myself a pat on my back as I certainly have made improvements. Some may think redoing a post is easy but seriously it is not. There are some I consciously make an effort to make again, remember to take photos and go back and re write the write up, add new photos make corrections to grammatical mistakes etc etc. And then there is the sharing bit on all social media. Most of my old posts will not have been tweeted or you wouldn’t find them on Instagram. Basic recipes that I make so many times, I just forget to take the photos. When I have to share them or use them to attach to other posts, I just want to cringe and kick myself for not remembering to take the photos. Anyway, lots of changes are on the way… my blog is migrating very soon. Hopefully in the process I’ll not loose my hard work. 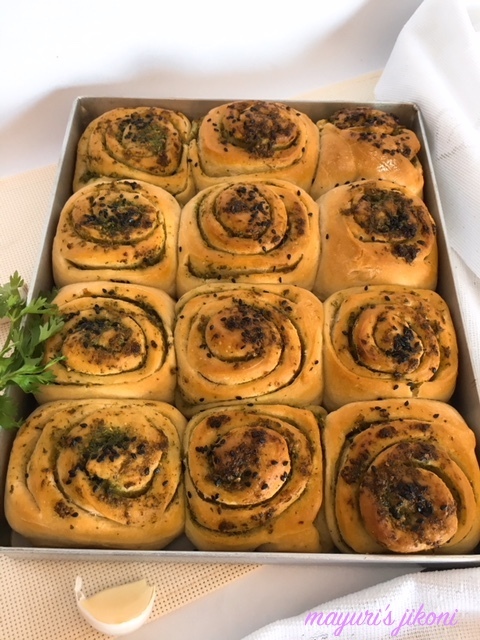 One of the recipes I bake many times and forget to take photos is this ever so famous garlic rolls. So last week I baked them just so that I could take photos. The rest of the menu was planned around the rolls! I love garlic bread. There have been days when I have finished off 6 to 8 slices of garlic bread without realizing it. There is something comforting about hot bread and nice garlicky butter melted on top. However, instead of the normal garlic bread I decided to make these garlic rolls. 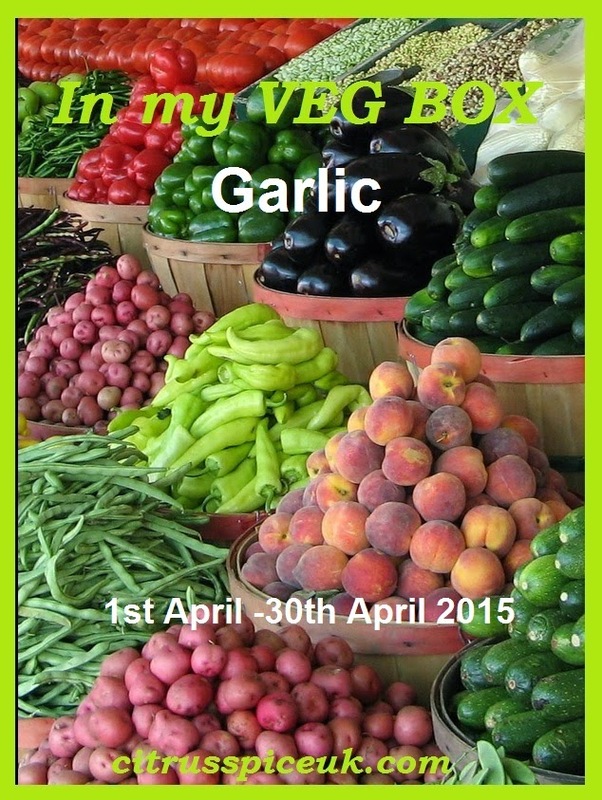 Goes well with soups, salads and hot masala tea or coffee, that’s if you don’t mind your mouth smelling of garlic. These rolls turned out superbly soft. You may wonder masala tea and garlic bread and I ask you why not? we eat all sorts of spicy, oniony and garlicky snacks with tea. I thoroughly enjoy garlic roll as breakfast. Forget the smell or garlic…chew on a chewing gum! Put flour in a big bowl. Add sugar, salt and yeast and mix well. Make a dough using the lukewarm water. The dough should be soft. Place the dough on a floured board or worktop and knead it for nearly 10 minutes. If you have a dough machine, then knead it for 5 to 7 minutes. The dough should be soft, silky and smooth. 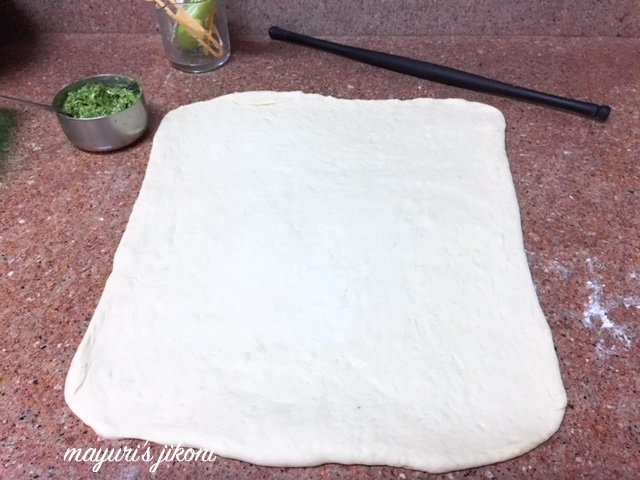 Make the dough into a round ball. Take a bit of oil and smear the dough with it and also lightly grease the bowl. Place the dough into the bowl. Cover and place in a warm place till it becomes double the size. This will take about 1½ – 2 hours. In the meantime prepare the garlic butter. Grind garlic, coriander and chilli in a herb mill. Add the paste to the butter. Add salt. Mix well. When the dough has risen, take it out from the warm place. Punch the dough down lightly using your knuckles. You will need a 9″ x 12″ tray. Grease the tray lightly with oil or butter. 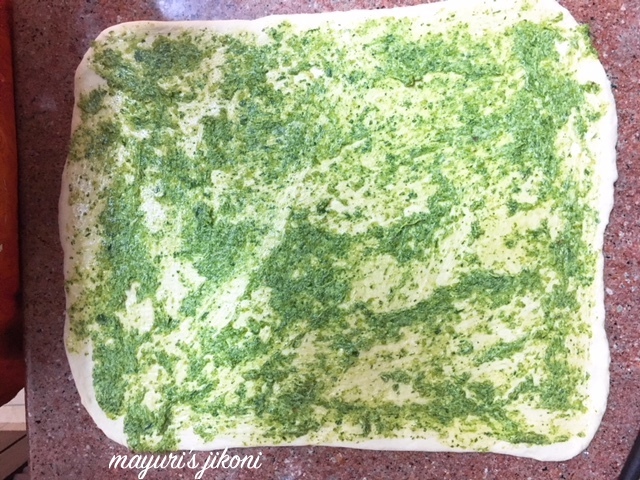 Roll the dough into a 10″ X 12″ rectangle. The longer side should be towards you. Apply the garlic butter on the rolled rectangle. Try and smear right till the edges. Leave some to apply on top. Roll up the dough, like a Swiss roll. Pinch the seams to seal. With your hands slightly flatten the two ends. Cut into equal 12 rolls. Place them into the greased tray, quite near to each other. Leave the tray in a warm place till the rolls become double the size. They will be stuck to each other. This will take about 30-45 minutes. Brush the remaining butter on top of the risen rolls. Sprinkle sesame seeds over it. Place the tray in the oven and bake for 20 to 25 minutes till the rolls appear golden brown on top. Using a spatula, gently lift the whole set of rolls and place on a wire rack to cool for a bit or serve immediately. If you want you can place the rolls far apart to bake as individual rolls. If you use normal dry yeast then you will have to let it ferment in lukewarm water and sugar for 10 minutes. Try half plain flour and half wholewheat flour. If the dough is not soft (should stick slightly to your fingers when you knead it) the rolls will turn out dry. While kneading the dough, smear your hands with oil. Though I bake a lot, I never to seem to get the exact size of rolls. So don’t worry! Son’t fret and fume in trying to get the exact measurement. I’ve written the measurements merely for guidance. I know what you mean by saying about pictures, sometimes I feel same too 🙂 Garlic bread sounds so delicious so soft like a cotton wool, I must make again as my sunny boy love these rolls. 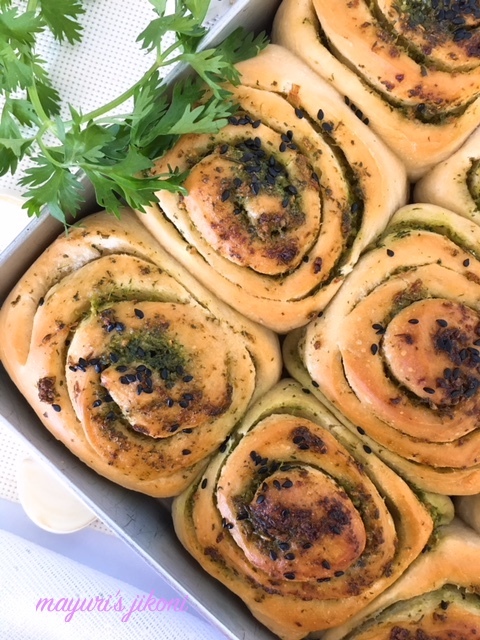 Your garlic rolls look delicious – I often plan a whole meal around one thing that I fancy making! 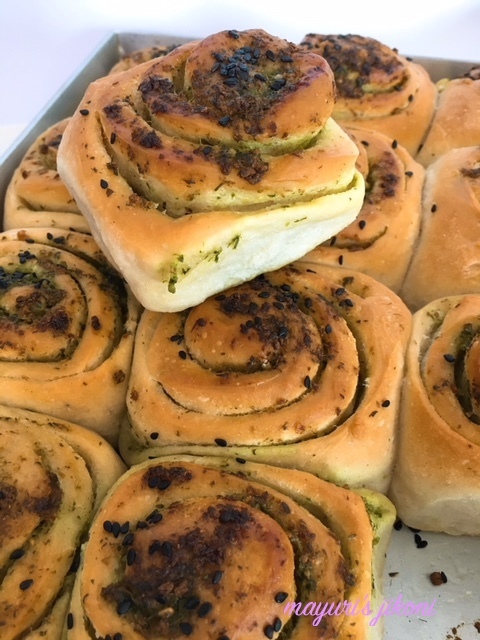 Wow what a lovely bake this is.. Garlic bread and Garlic bun are our favourite breakfast item, Garlic roll sounds too good .. Absolutely delicious snack.. I used to make it always when I was in Brazil. My friends still remember it and mention in their chats. Those rolls are so heavenly!..wish I could dig into these right now! How beautiful those rolls looks and they looks just prefect to enjoy with some cream cheese. Stunning swirl rolls there. Garlic rolls are my favorite and this rolls are really tempting!! Love the addition of coriander leaves , perfectly made !!! Good luck with the migration and do backup before you migrate. I have so many recipes to on the blog that need better photos. Though I make those very often, just lazy to click or slips my mind. Rolls have come out so good. Garlic butter with coriander and chillies sounds really good. Nice click. 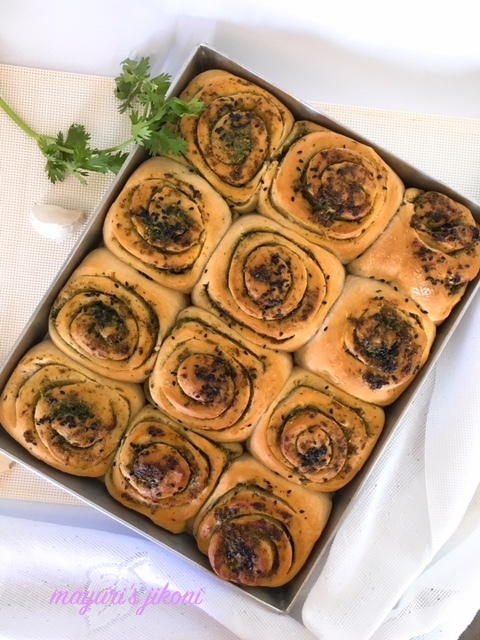 Garlic flavor is y favorite in savoury baked goodies and these garlic rolls looks amazing. I know what you feel about old photos and we all are in the same boat. OMG! those rolls look so inviting. I wish I could bake them now. A lot of times, I too doubt if I took all those pics in the old posts!! Anyway, these rolls look very nice and I am sure they would have tasted awesome! Wow what a delicious snack, perfect for this weather. Mayuri, you are tempting me with that tray of garlic rolls. Looks to good and I can finish the whole tray by myself. Unfortunate for me, I have a huge competition at home for garlic rolls. awesome rolls..the pics look so live you just want to grab these rolls. wow mayuri, those rolls are calling my name, a warm bowl of soup and these rolls are all i want to nurse my bad throat!! Looks perfect!